This is my fist ever batch of truffles. Full fat and proud. Break the dark chocolate tablets in small pieces and place them in a ceramic bowl, then melt slowly in a bain marie until all the lumps are gone. Cut the butter in small chunks and add to the chocolate. Gently stir with a spatula until the butter too has melted. Now remove the chocolate from the heat and while continuously stirring add the double cream and the vanilla, mix well until it is completely integrated to the chocolate. Then transfer immediately in a bowl with a lid. Once the chocolate has cooled down. Cover the bowl and place it in the fridge for at least an hour or overnight. If you choose to leave the preparation overnight in the fridge, you might have to leave it at room temperature for at least an hour before you start working the truffles. Please remember that, just as butter and chocolate melt at the contact of the human hand’s heat, so will the truffles melt as you start rolling them. Just don’t handle them too long and it will be fine. To roll the truffles, scoop from the bowl with a tea spoon, place it in your hand and start rolling in the palm of your hands making sure that it is a lump free and compact ball. Immediately place the now formed ball in the bowl with chilli flakes and lightly roll so the flakes will stick on the truffle without incrusting in. Chillies are hot so, the lighter the covering on the surface, the better. Do the same for the classical truffle with the coco coating. For the truffle with the whole nut, add the nut before rolling into a perfect ball, then dust with either chilli, coconut or coco powder. 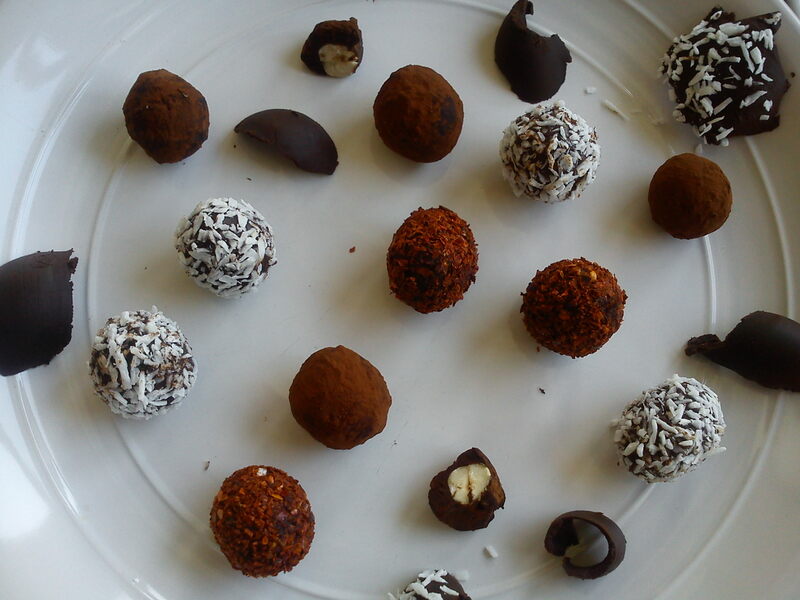 If you do get bored after you have done the quantity of truffles you needed. Just turn the left over into spreadable chocolate. To do this, dissolve a bit of sugar into some double cream and gently fold into the now melted chocolate until you obtain a spreadable consistency. Note: if you intend to add sugar to your truffles, dissolve it in the double cream before folding in it in the truffle mix.